Growing up in Norton. Now it was a long time ago, but at the time it was an idyllic time in our country which was known as Rhodesia. Where do I begin to tell the story, the sweet love story that is older than the sea, where do I start? It was before the war had started and politics and hatred had not really begun, but unbeknown to us the indigenous people were quietly simmering and soon all hell was to break loose. So it is important to tell you about some of the people I knew who had very different views, so here goes. I am at Norton Junior School as a boarder and I become very friendly with a guy called Jeff Dix. An amazing talent who could do just about anything from sports to art and so much more. He also had an older sister who was teaching at the school called Judy who to this day remains as one of the most beautiful woman I have ever known. Now the other boys had ganged up against Jeff and a great fight was had. I was the only boy in the school to support him, so the two of us were not exactly popular at the time. The long and short of this is that he asks me out when his parents come on a Sunday. Judy is also with us and we drive past a farm known as Merton Park. Even in those far oft times it was one of the show pieces of the country and Rhodesians en masse sure knew how to farm. 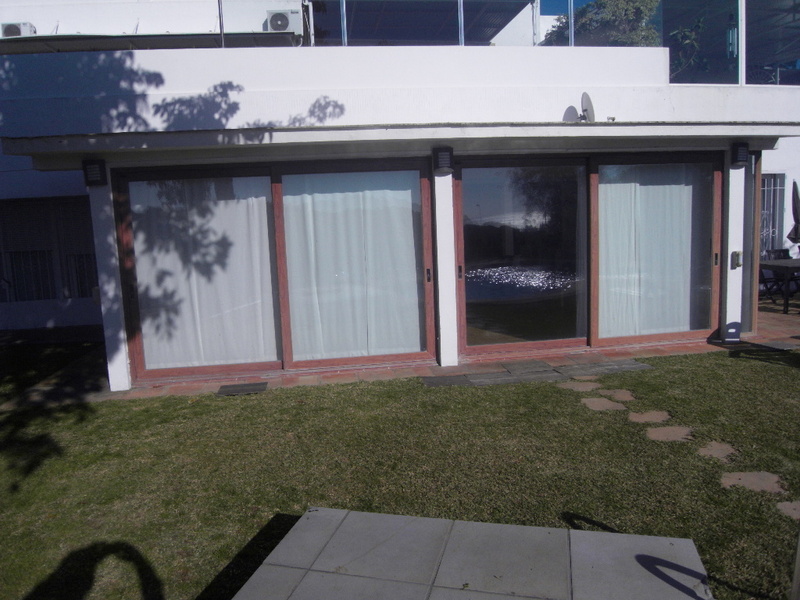 It was owned by Sir Cyril Hatty, knighted by the crown for his services to the country as Minister of Finance. He had a son Graham, who was working for him and a great romance began between him and Judy, whom both are still married to each other. Now here is where politics enter the equation. Rhodesia had a new Prime Minister called Ian Smith and he had just broken away from the crown and declared Rhodesia’s unilateral act of independence. You see Rhodesia had always been a British colony but independence was to be granted the same way this was given to Australia and New Zealand but in our case was denied. You see what I am really leading up to is that not everyone thought the same way about politics and how the country should be run. Sir Cyril Hatty for one had exactly the opposing views to how Smith thought. However the bulk of the white people agreed with Smith. Which is about where I come in because as a young boy I had learnt that everybody has opposing views and this did not mean that thinking differently made you any less well liked. It certainly didn’t work that way in Norton. I have finished my secondary education and am at home on the farm before commencing to do my National Service. It is just before Xmas and a variety concert is being held in the hall at Norton Country club. I have been playing snooker with some of my mates so am late getting there and all the seats have been taken, so sit on a table at the back of the hall. Lady Doris Hatty who used to be a chorus girl is singing on stage, dressed up in a long dress and floppy hat which the girls wore way back then and she sure could sing. One of my mates says something to me at the back which causes me to burst out laughing. Lady Doris immediately stops singing and says. ‘Ah Spook, I’ll carry on when you have stopped laughing.’ The whole hall swings around and showers me with dirty looks. TSUH, and I wasn’t even laughing at her I promise Mum. It is not long afterwards that I am left totally deaf from my very short time in the army. I go to Gwebi Agricultural College and in my last year there do Merton Park as my project. Sir Cyril and Lady Doris Hatty couldn’t have been nicer to me or more helpful as were Graham and Judy. Times are now bad and the war goes on ever escalating. Politics are now the forefront of everything and everything we stood for looks like it is being lost. Robert Mugabe, onerous dictator has a purge of his cadres in Zambia and Josiah Tongarara is murdered. Sir Cyril Hatty makes the eulogy for him and a most fitting tribute it was. Then there were Ralph and Marguerite Palmer who were also farmers in Norton and two nicer people one couldn’t hope to meet. I well remember when I was chosen for Standard Bank first cricket team and my Dad told Ralph who replied, ‘he’ll play for Rhodesia yet’. Now they were completely opposite to most whites in Rhodesia and passionately believed ‘that you can’t judge a man by the colour of his skin’. Somewhere in 1980, and Mugabe was in power, Jim Sinclair there son in law and onetime head of the Commercial Farmers Union, came over the radio one morning. In a most distressed voice he told us ‘that there had been a murder’. It was none other than his beloved Mother in law Marguerite who had been shot in the head through the window in their household. By an African soldier, of all people. He wasn’t one of Mugabe’s lot but a former soldier in the Rhodesian African Rifles, who I guess had finally lost it and gone off his head. It was a most distressing time for all who lived in our country. Now as time progressed and things became worse and worse in our beloved country. Sir Cyril Hatty paid a visit to parliament and there was no paper in the toilets. Can you believe it? As he said himself, he’s an old man now and the call of the toilet is never far away. The long and short of all this, is, even people who were all for the change now realised that it actually had all happened to fast. Their lovely farm Merton Park is now no more as with most farms in that poor blighted country. Ronda, Spain. 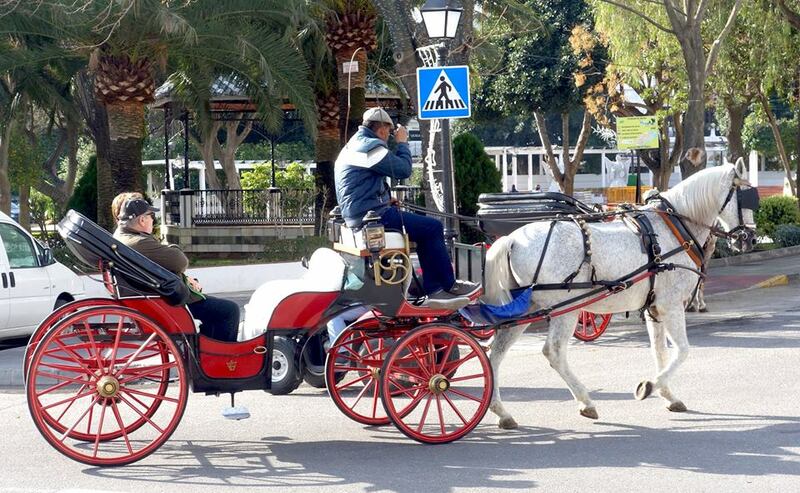 Yesterday saw us in Gibraltar, today we are heading for Ronda. We get around, round, we get around. Once again Steve is driving, my apologies, chauffeuring. True to form I am clueless as to where we are heading and for why? Apparently, we are heading for them hills babe. It is some drive OK and all credit to Steve. Put simply, the road is following the contour and it sure is long and winding. Luckily, I have never suffered from car sickness and I pity those that do, because, they sure would have been awfully sick. I am quiet for a change and hanging on to the rest for dear life. It is actually a long way up, but, eventually we arrive. It is quite simply, spellbinding. A city, built on the top of a mountain. Quite why, remains a mystery wrapped in an enigma to me (Winston Churchill). I’ve always loved those words, a very bright man whom the free World owes an enormous debt of gratitude to. Now Ronda has a very long history almost going back to the beginning of time. It has been ruled or invaded by many very different people from Arabs to Romans. Actually the road we travelled on was first built by the Romans. And since then many great writers etc. including Ernest Hemingway have used it as a refuge or just as a place to reflect on. Believe it or not in his famous book, ‘For whom the Bell Tolls’ the execution of fascists in the Spanish civil war, according to him was based on factual events here in Ronda? However we are just tourists taking in the amazing sights one experiences here which I will show you pictorially later on. So in essence we are just walking around the place and getting the feel of it. We come across a sort of like Pagoda and sitting there by herself is a Spanish woman playing an electronic harp and singing softly. Now I don’t have much hearing albeit I do have a Cochlear ear implant which enables one to hear sound. It was one of those rare moments in time when time appears to stand still. Frankly it was one of the most beautiful things I have ever heard. Not that I can be much of a judge as already explained. So I call Steve over and say, ‘what do you think of that then’? And his reply is immediate and unequivocal, ‘beautiful’. Later I see his wife Shay go over and buy one of her CD’s and I trust it will give you enormous pleasure listening to. Now the real reason for the interest in Ronda is, it is built on the top of a mountain and the engineering feat of it is quite mind blowing going back so far in time too. I am going to show it to you pictorially now and I trust you enjoy it as much as we did? Photos courtesy of Steve Geach and Max Knobel, a pot-pourri from both. Now Max is frightened of heights and her husband keeps on pretending to try and throw her off and she is reaching the end of her tether and asks me to keep him away from her. I’m frikened of heights also and can barely plug up the courage to stare over the wall. Shivers. I can imagine being a husband coming home, three sheets to the wind and saying to dearly beloved, ‘let me check if I closed the back door’, aaaaaaaaaaaaaaaaaaargh, thump. And it is time for some lunch. My wife asks me what I am going to order, so I say, probably another hamburger. To which she explodes, ‘you can have a hamburger any time at home, whilst here try out some Spanish food. What about the Ham’? So I try out the Ham and bleeding terrible twas too, but I finished it. She then asks me what was it like so I tell her. Tsuh, dirty looks abound even though I am just being truthful and all. From empty chair and left. Shay, Penny, Siobhan, Himself (coughs in la di da voice), Lauren, Jack, Bruce, Max. Missing is Steve who is busy taking the photo. After lunch we wander around a bit more and then drive back home. Our break in Spain is approaching it’s end and we only have one more day left, sad to say. Siobhan is the delegated chef that night and she rustles up some Spanish supper. Quite what it was I have forgotten, but, I loved it, very tasty and all. Tomorrow Marbella, that’s the town and not some graze. Gibraltar. 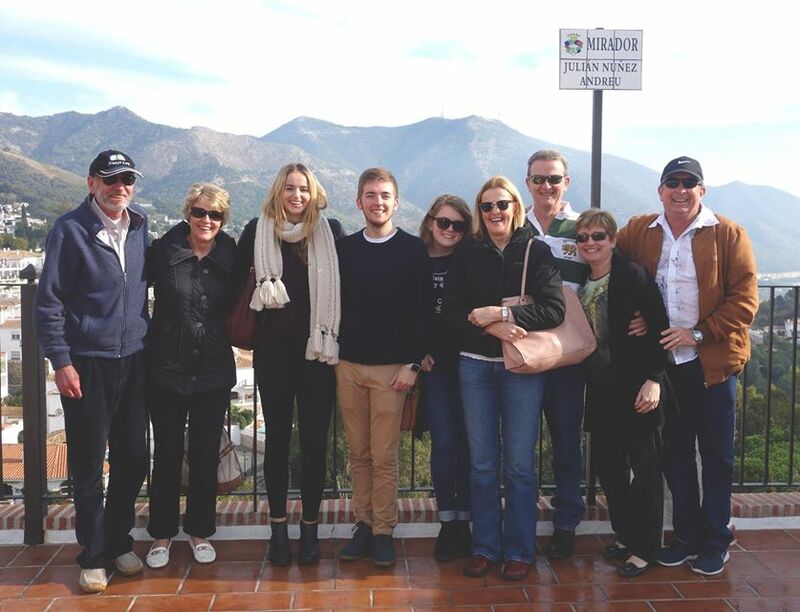 A visit there with the family on our trip to Spain. It’s a strange old world in the end because although I had an excellent education, and came from an Old Colonial country. 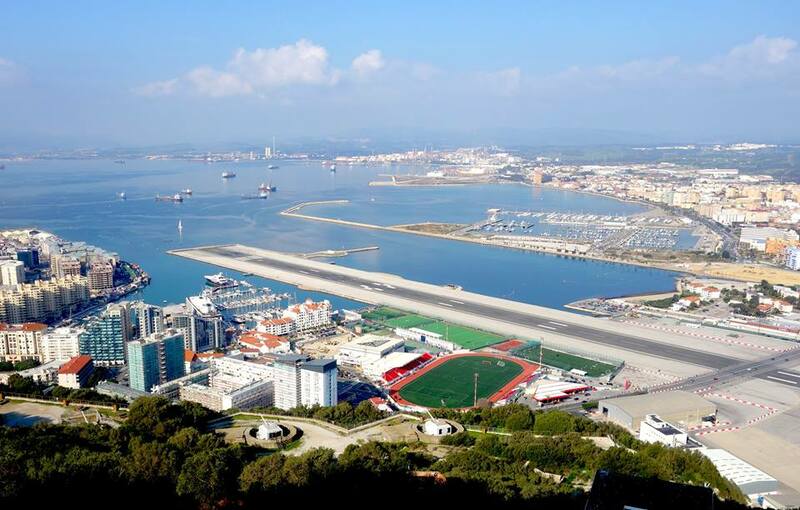 I always thought that Gibraltar was an island in the Mediterranean. Well it is in the Mediterranean alright but whether it is an island or not I’m still a bit lost? You see we drove there from Marbella in Spain, battled to find parking, waited for Bruce, Max and their lot to arrive, then walked, came across a border post where we flashed our passports and then we where in. People were going in in droves both cars and pedestrians. I was still under the impression that we were going to catch a ferry to the rock. After all, I only went to a Plumtree school. Now I am a very slow walker, always have been, but am now at the advanced age of 60 and very unfit. The long and short of this is that I was miles behind everybody else. So they stopped with an exasperated, ‘where is Spook’? I call it luck, or the art of knowing how to box very clever like. You see they stopped at a taxi rank and by the time I arrived they were already being hassled by one of the drivers. Now hassled is the wrong word because he sure knew his onions and everyone was mesmerised by his pitch. The long and short of this is, that he had us. So we hired one of his Combi’s and the Knobel family hired one of his mates. Thus began an amazing trip in and around Gibraltar. Photo courtesy of Max Knobel. 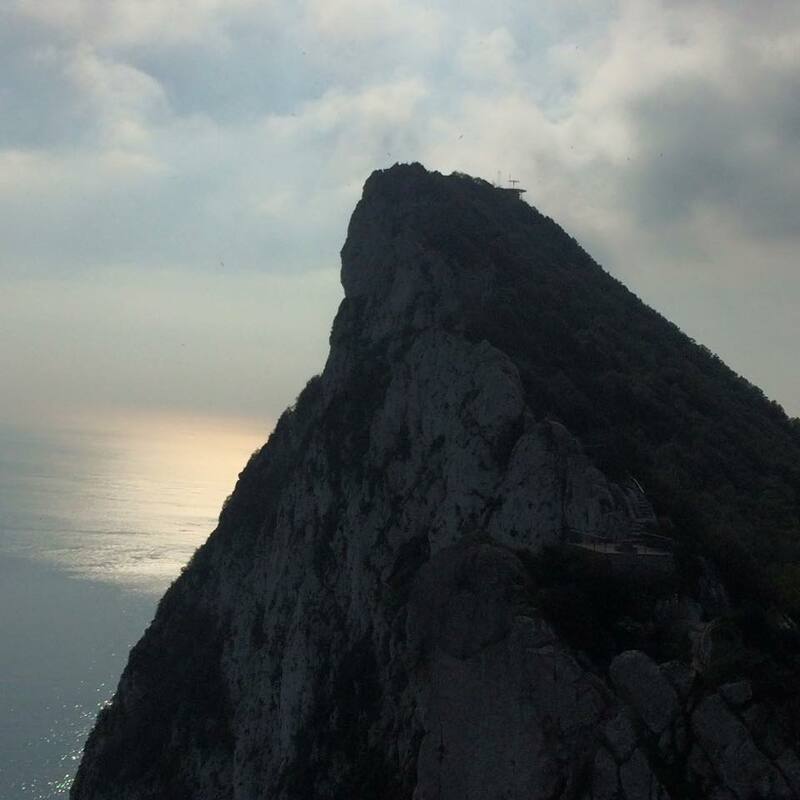 Now that is the rock of Gibraltar which can be seen from miles away. 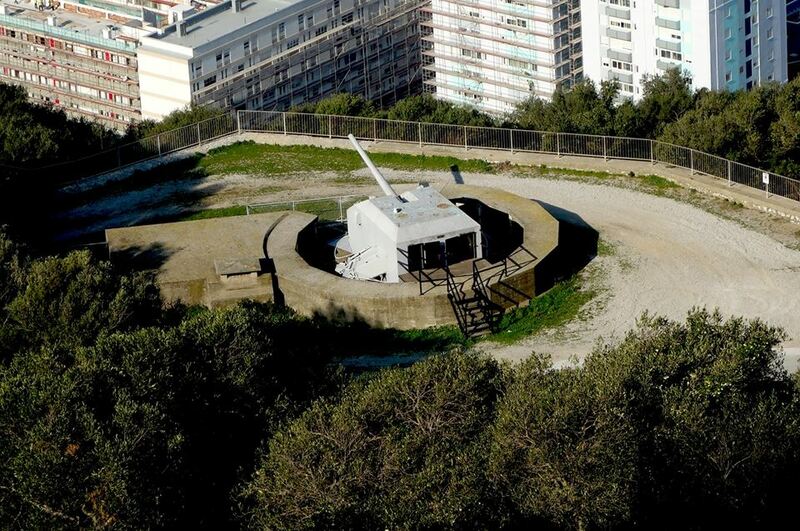 Now I found the whole experience fascinating as had read so much about Gibraltar during the war years. Now that I was there I finally began to see the importance of it all. The hills of Africa can be seen in the distance and the ferry ride to Morocco takes about 20 minutes if my memory serves me correctly? I must add I never knew any of this before so it was wonderful to be there and have such a knowledgeable guide. 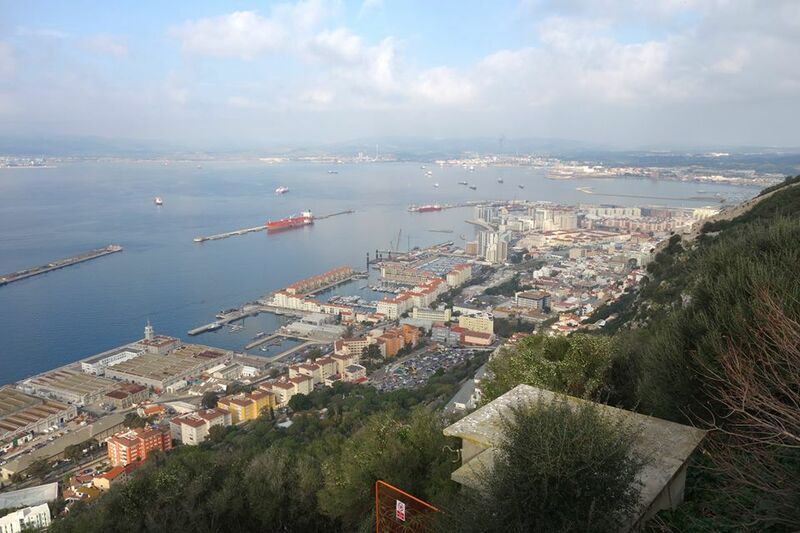 I kept on thinking to myself that during the war years they must have been sitting ducks and I knew Gibraltar took a terrible pounding in the war. However they stood firm and all credit to them and a stiff upper English lip. Our guide is giving us a running commentary on the history of the island and has a couple of drop down small TV’s which show us pictures of it all. He has his back to me so I missed much of the commentary still needing to lip read. Fascinating stuff it was to. Steve fills me in a bit when we stop and I never knew how much the Spanish and British detested each other, largely over this which has a long and chequered history of control by both sides. I’m mainly fascinated by how narrow, long and twisting the road up here is and often am left wondering how the Combi can even make it. Our first stop is what I remember as being called Saint Michael’s Cave. 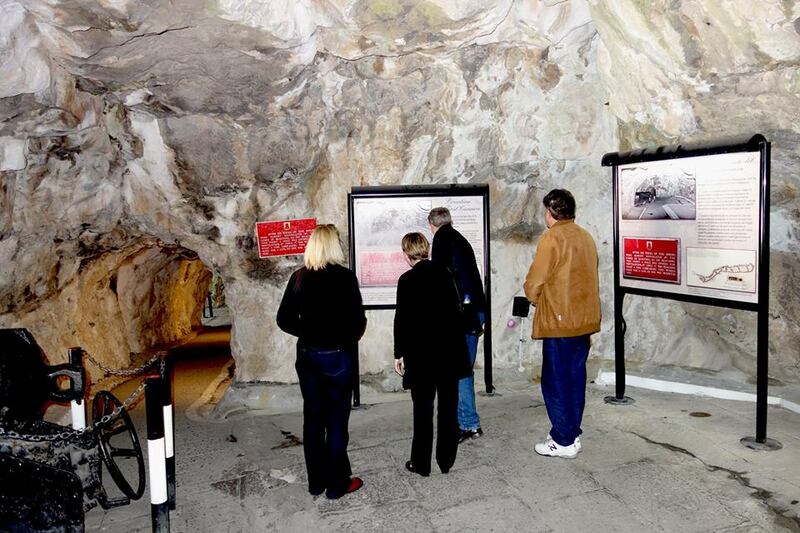 The rock is made up of Jurassic limestone and herewith some photos taken by us of the cave. 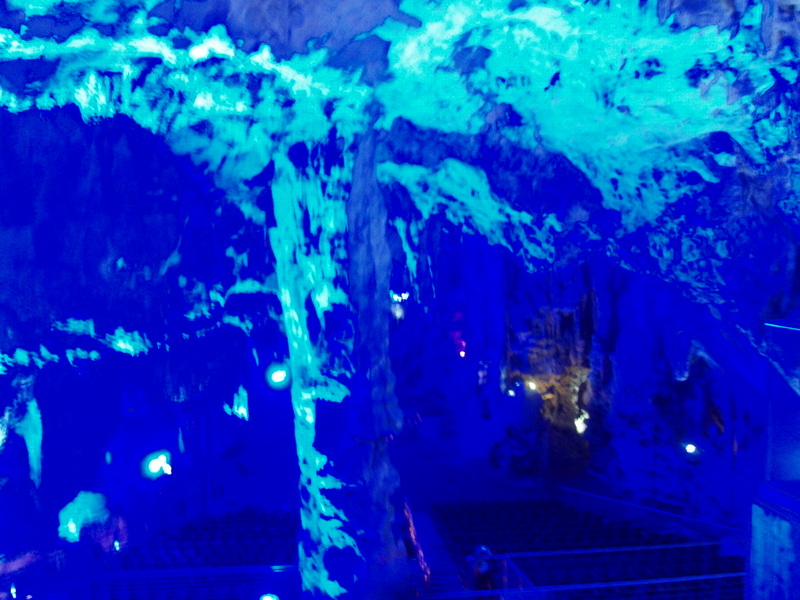 Now it’s a bit blurry but shows an auditorium within the cave and the stage is at the bottom of the photo. Photo’s taken by my wife and they appear a bit blurred, maybe because of the special lighting effects or all the stalagmites and stalactites. Be that as it may it is all that I have got. Outside there is a great flurry of (says in heavy American accent), ‘stripe assed Bayboons’. It always amazes me how people love monkeys and watching them play. Even Winston Churchill was concerned about them during and after the war years. As far as I can remember they are no others in Europe and keeping them from extinction is an ongoing task. Even I had to laugh watching them during my smoke break especially the little ones. They are so human like after all. 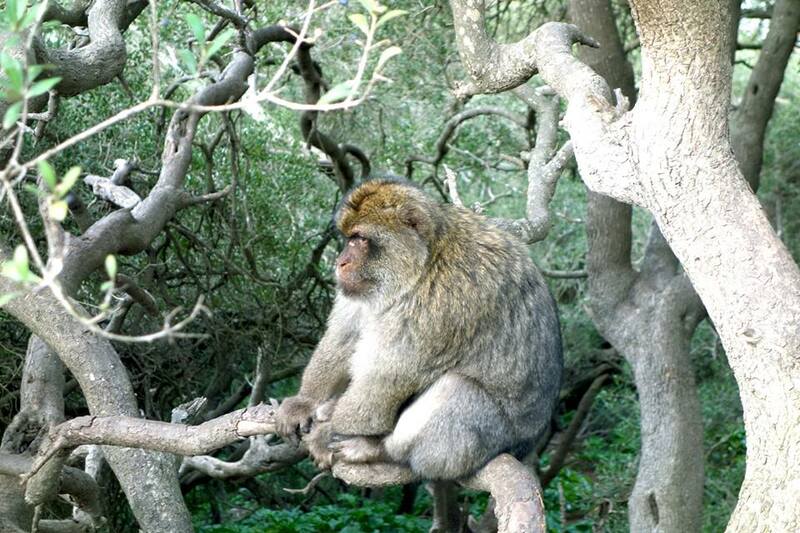 Barbary Macaques is the correct name for them but Americans cannot get their tongues around this (winks). Photo courtesy of Steve Geach. We keep on going up the rock and get to a place of tunnels hacked into the Rock years ago as a system of fortification many, many years ago, with cannons hauled up there and small apertures cut for them to fire out of. I was fascinated once more but was going through a stage of I no longer care about my blog so wasn’t carrying my camera where I would have been snapping away at everything in sight. It was mind blowing how they got them up there, not least the tunnels themselves. Further down one could see cannons strategically placed during the second world war years. It appears none of the others was interested in taking pictures of it either, how sad. One day perchance I can download some from the Internet? So herewith another breathtaking photo of Gibraltar taken by Steve once again, and I trust this gives one another view of the importance of the cannons? Blimey, having said all that, have just found some courtesy of my brother in law Steve, so am going to add them after the fact. Sighs, poor old Dad eh? The entrance to the tunnels all 33 miles of them. Well our guided tour is finished and the driver takes us back into Gibraltar were we find a British pub come restaurant and settle down for some grub. I had a hamburger which made a welcome change. Slowly ever so slowly we make our way back to Spain, this time on foot. On getting to the runway we find the gates locked and an amazing scene is taking place. There is a British Airways jet waiting to take off and it goes down the runway to the bottom, then turns and it is all systems go. We have an iconic photo of it taking off right before our eyes. I silly you not. 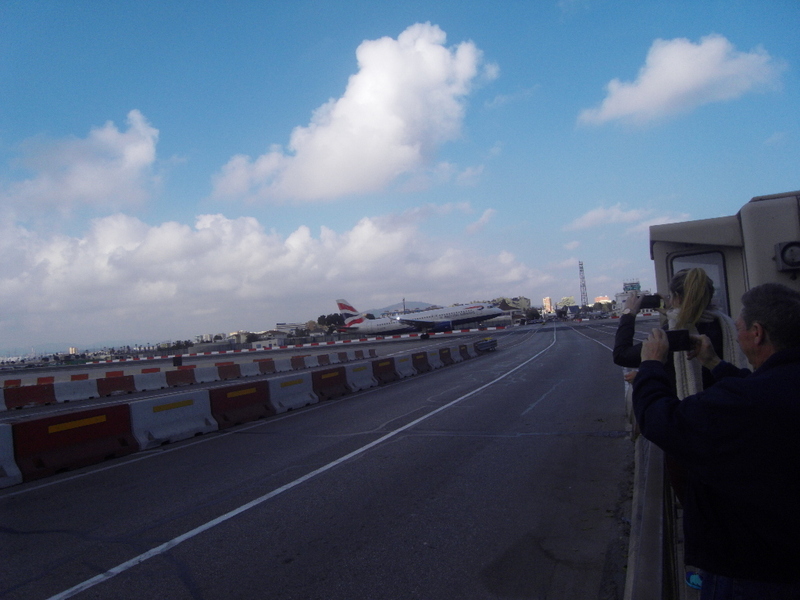 BA jet taking off in Gibraltar. I told you and that is our youngest Daughter Siobhan also trying to get a photo of it. Notice, front wheel is in the air. It zooms off, the gates are opened and one only has so many minutes to walk across the runway. Everyone zooms off leaving poor old dad miles behind, but, I made it in time. So ends our trip to Gibraltar, tomorrow Ronda and I trust you are all holding your breath in anticipation? 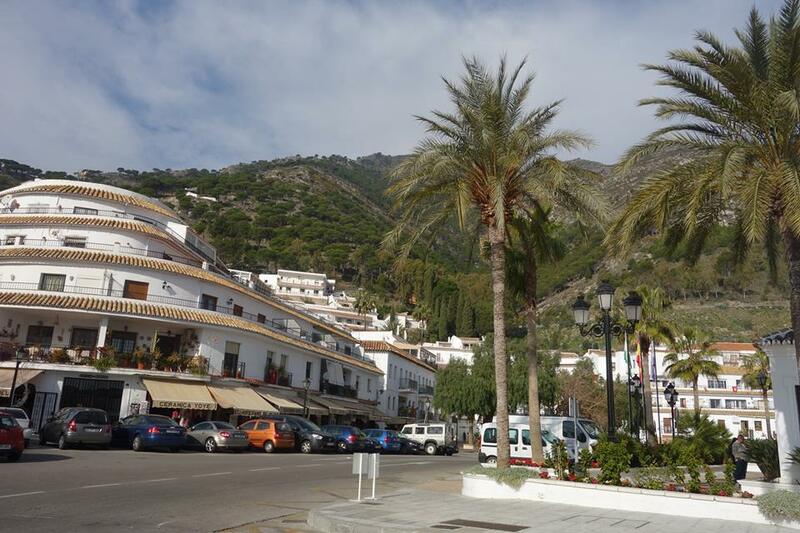 Mijas, Spain, heading for the hills. Early morning and we go to the Airport in Malaga to collect my youngest daughter and then we are heading for the hills in beautiful Spain. Ostensibly, it is a shopping spree for the girls who love that type of thing. Personally I hate it and Steve is not far behind. 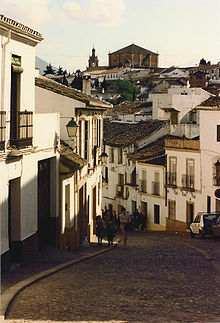 Now I have been told that when in Spain try going to and visit some of the villages. Little did I know that Spain is so well built up, so was expecting some dump until I got there myself and found out differently.We arrive there and find an underground car park, walk back straight through the gates and turn right on the pavement, then right again at the top.There are a whole lot of donkeys there attached to posts and dressed in some type of ceremonial gear. By gum the pong of the poofies was overpowering and I am an ex farmer who was almost overpowered. No poofies were seen on the ground though so someone had to have been very busy. I slip into overdrive and chant, keeeeeeeeeeeeeeerist let’s get out of here. 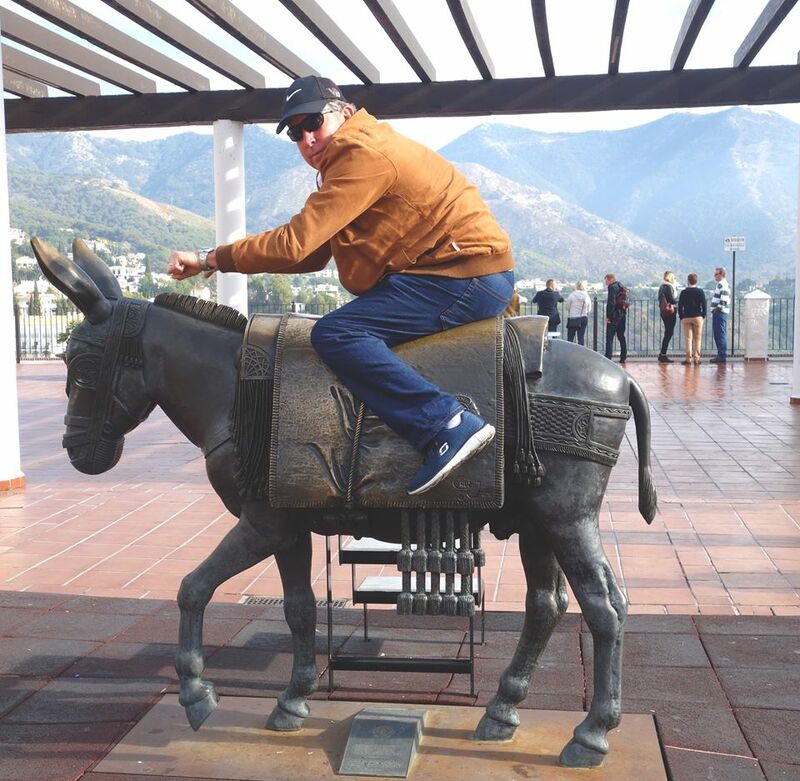 We then come across a statue and Steve sets the tone for the day with this immortal Striker Strydom pose. If one looks in the background one can see the rest of the tribe. Shortly after this Siobhan gets snapped but very ladylike in comparison. If one looks at the background here one can see the type of scenery which is very hilly and quite delightful and before I move on a snap of what the village looks like. And here is another quite delightful snap and many people took rides on these. Thankfully where they waited smelled much better than the place of donkeys. Albeit the horses were doing poofies left right and centre but someone was coming along with a hosepipe and clearing it up. It’s wonderful to take pride in your town and where you live, unlike so many countries which can’t be bothered? I did say that ostensibly this was a shopping trip for the girls who are already busy ferreting around in this shop. Suddenly Steve’s wife shrieks for him to go in and he comes out .According to Steve one has to haggle about the price and he is dead chuffed with himself having brought the owner right down in price.The long and short of this is that he has bought a leather jacket and it gets funnier from here on, as every place we go to and all the waiters keep on saying to him, ‘nice jacket’. And when they stop I chime in about every 5 seconds with ‘nice jacket’, until he turns around to me and says,’f**k off’. TSUH. 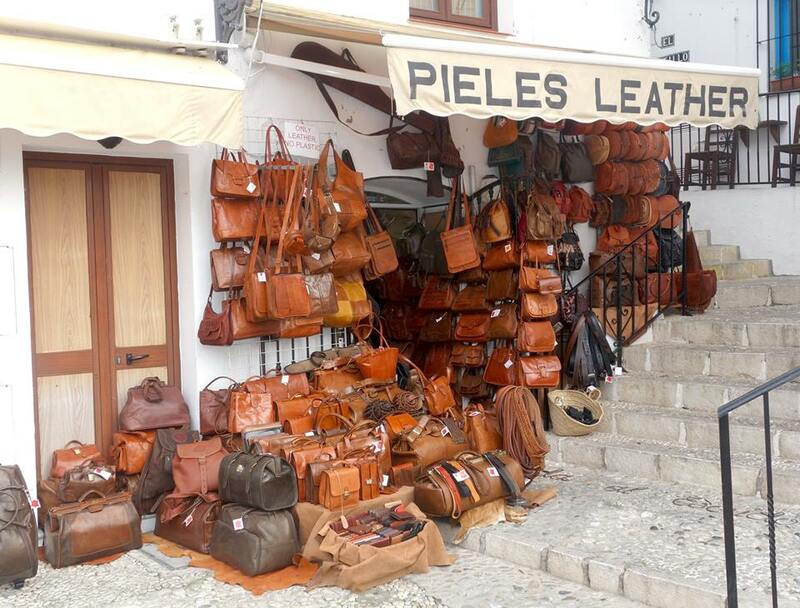 A pot-pourri of photos in Mijas. So it’s off to lunch we go and you can see where we went up above. Everyone ordered Spanish graze and I had Prawns wrapped in bacon which I must say have never had them this way before. We also had a lot of laughs and when finished walked around once more taking in the wonderful sites and scenery and then it was time to g back home. Tomorrow see’s us visiting Gibraltar, magic man, pure magic. 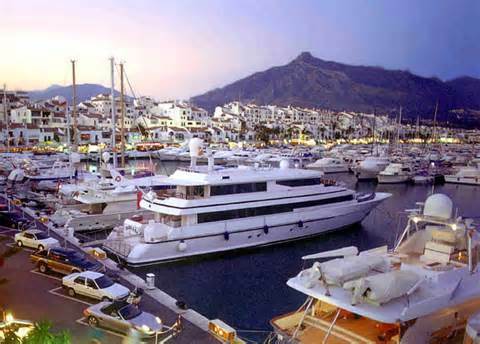 Puerto Banus, Spain, our first day in Spain and a quick trip there after arriving from the airport. Now the most important thing to understand is, the old toppies here on this trip have not been together since 1988 when Bruce and Max came to visit on my farm in Barberton RSA on their honeymoon. Shay and Steve were also staying with us at the time. My, but, 27 years is a long, long, time. What this really entails is, that it was an old Knobel get together of brother and sisters and the rest of us were just hangers on so to speak. Such is life. Now Penny and I have been up since 4am and I for one am tired. 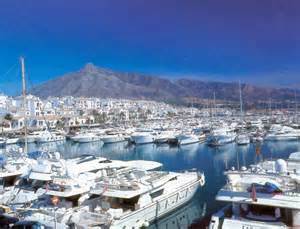 Anyway to cut a long story short in the afternoon it is decided to visit Banus and their famous Yacht port in Marbella, Spain, magic man, so many Yachts and this is just one small harbour in relation to the rest of the World. Ah the joys of having a few bob eh? 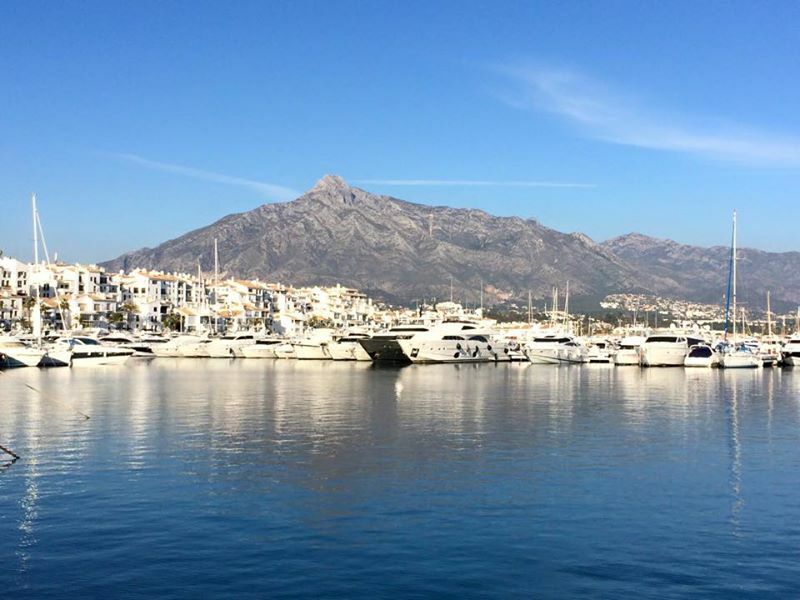 Wandering around the harbour, Banus, Spain. Now if the truth must be known my wife was carrying the camera as she never took any photos, nor did anyone else as far as I can gather. So was left with no alternative but to download some I found on Google. Now that is more or less how we found it. Fantastic and a lovely view of the buildings in the background. 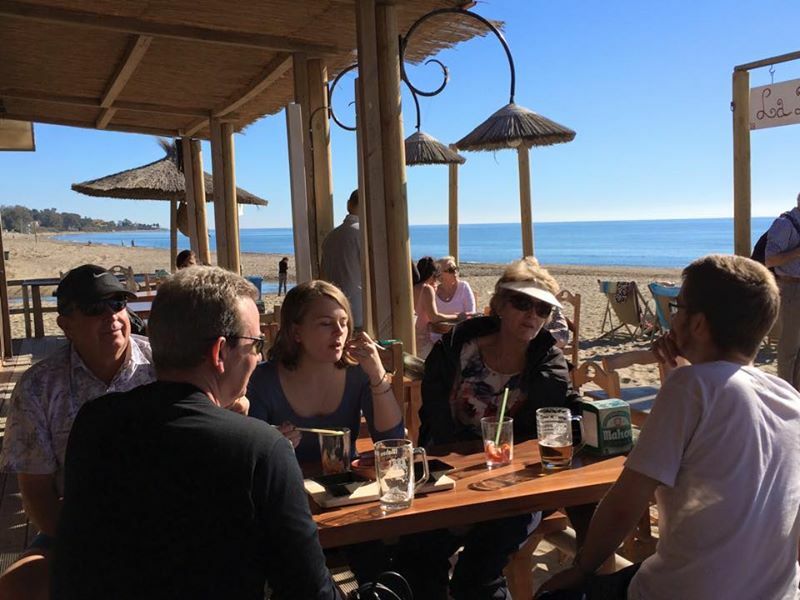 I was already so impressed with Spain from our drive from the airport along the Costa de Sol. So clean and fresh and more importantly all the women were so well dressed and the whole place was spotlessly tidy. Keep it up. 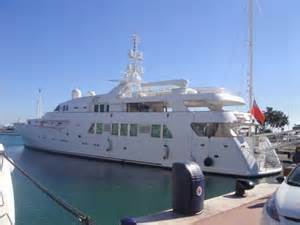 Basically then we are just wandering along the sidewalk looking at all the Yachts and true to form I am miles behind everyone else. Poor old Dad hey?Eventually though Steve slows down, or he just felt like chatting with me and we came across this or something like it. I’m mesmerised and say to Steve, ‘I often wonder where people make all their money from seeing as I never made a cent’? He says, ‘that’s the problem Spook, people like you and I are just there to get ripped off by everyone else’? So I say, ‘it always pisses me off having being a primary producer, yet everyone makes money from MY product except me’. Steve just laughs and says we are just suckers mate. Just then Jack Knobel Bruce and Max’s son rocks up and I ask him what he thinks of all the yachts. He says he’s not interested but, he does like cars, and I hate the bloody things. Each to his own hey? So once again a splendid view of the harbour. Now it is time for tea or maybe a few snorts, so we wander off to find one. Following picture taken by Max and I’m almost certain this was not the place we went, but, it’s all I have so may as well include it? 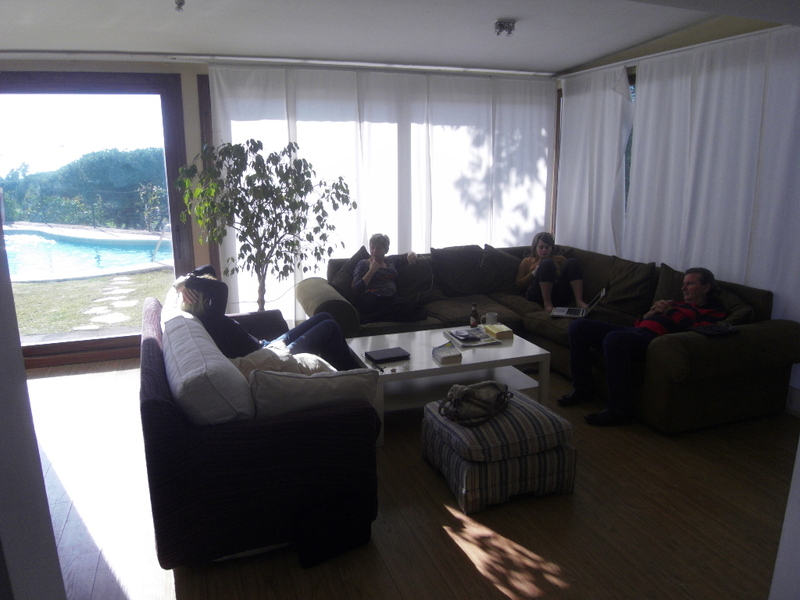 So now it is time to go home and relax so one more photo taken by my wife of the in door scenery where we stayed and which Bruce and Max paid for everything. Thank you both so much. Tomorrow Steve and Shay take us to the airport to pick up my youngest daughter Siobhan whom Bruce and Max have never met before. How strange? 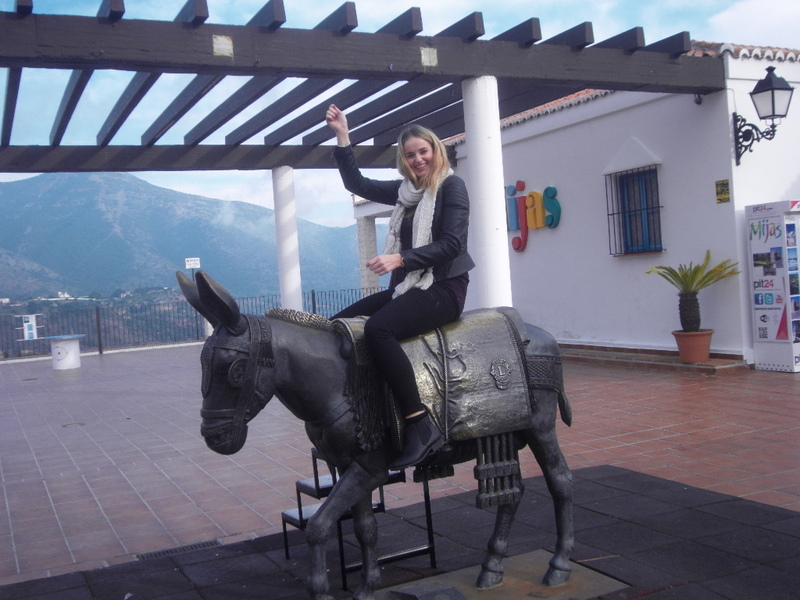 Then onto Mijas which I called the place of the donkeys and where we had some lovely fun. Stay tuned for the next instalment or beam out, after all that is what free choice is all about. Spain and our holiday there. Well, I’ve never been to Spain, but I kind of like the music so here goes. This is just a very quick review and will go into it more when I get the chance. We drove from Clonakilty to Dublin, spend the night there in a hotel geared towards Air passengers and were woken up at four thirty and took the free shuttle provided by the hotel to the airport. Seeing as we were only going to be airborne for three hours we took the cheapy, cheapy flight. Pigs might fly eh? By and large it was a family re-union on my wife’s side. 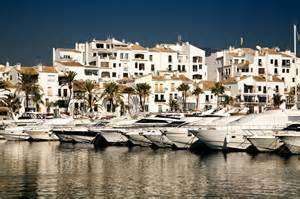 So my brother in law and his wife (mines sister) picked us up at Malaga airport and then drove us to Marbella where we stayed. First time I had ever been in a car driving on the right and some near misses were common. I could not believe how well Spain was built up. Mesmerising, holiday resort after holiday resort and lovely highways to drive on. After all this was the Costa de Sol. Well we made it in one piece and here is where we stayed. Charming, quite charming. 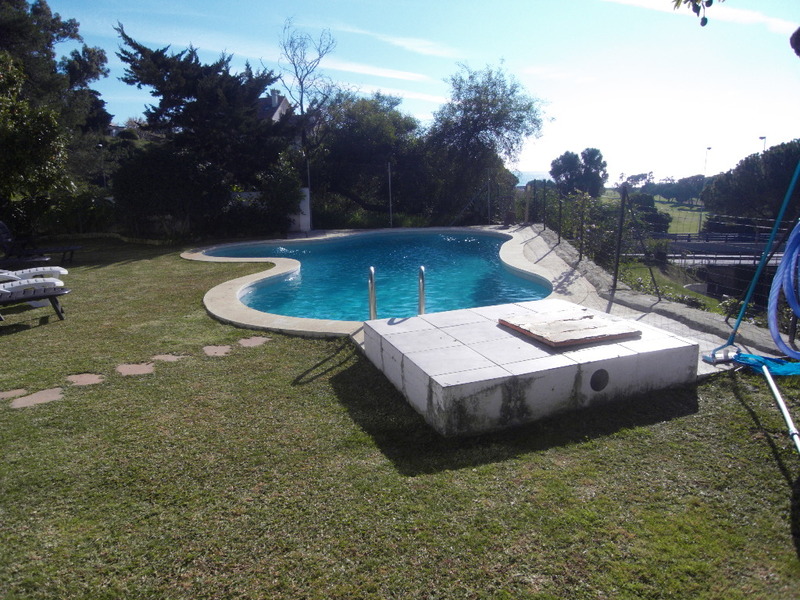 And another view of the swimming pool. Now if one looks past the fence, hard left the sea in the distance, then a fairway on the golf course, then the highway and just right of the bridge more golf holes. I trust this gives you an idea of where we were and now the family. From left to right, Spook, Shay Geach (my wife’s sister) Siobhan Moor (our youngest), Jack Knobel (Penny’s nephew), Lauren Knobel (niece), Penny Moor, Bruce Knobel (her brother), Max Knobel (Bruce’s wife) and the old skipang himself, Steve Geach (Shay’s husband. Now I am not going to go into much more detail here as if the truth be told am battling with my new PC and trying to figure out how to get my pictures on, but will get there slowly. 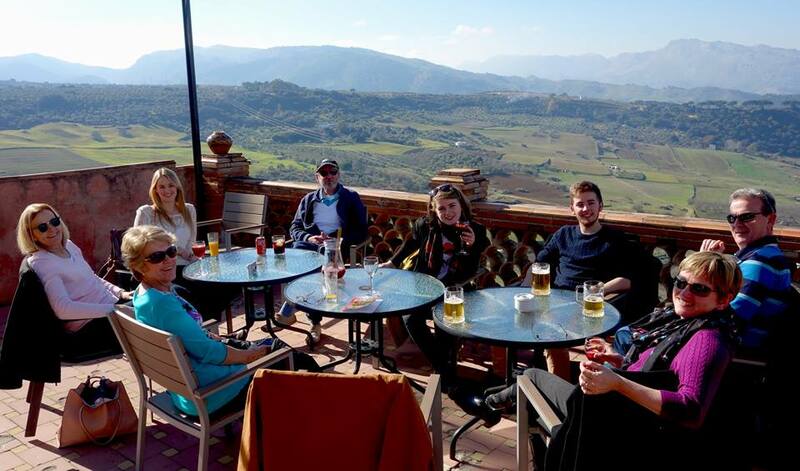 Basically we just visited a new place every day including Gibralter and our last visit was to Ronda which again was truly splendid. More on the way soon, provided of course that anyone is interested?